What kind of wasps are stephanids? For more than 200 years, over 150 authors have been trying to answer this question. Even so, for nearly a century and a half stephanids were hardly seen as an independent group, being considered partially or closely related to many different wasp families, such as Ichneumonidae, Braconidae, Evaniidae, Megalyridae, Gasteruptiidae or Aulacidae, among others. Stephanids are now classified in a separate superfamily, the Stephanoidea, first accurately delimited by Rasnitsyn (1969), who excluded the "Stenophasmidae" (= Braconidae) from the superfamily. Yet, current scientific consensus does not go much further than interpreting stephanids as an "ancient group of parasitoid wasps." 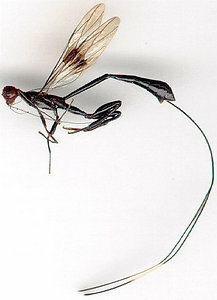 The family is often cogitated as a possible link between the paraphyletic suborder Symphyta (xylophagous wood wasps), the sole parasitic symphytan family Orussidae, and the remainder of the Apocrita (Engel & Grimaldi 2004). 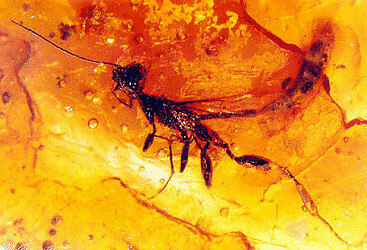 Male specimen of Denaeostephanus sulcatus (Aguiar et Janzen), included in Baltic amber, and correspondent drawing (by J.-W. Janzen). Images © J.-W. Janzen. Stephanids are known today from 323 living species, in 11 genera, plus another 8 species and 3 genera represented only in Baltic amber or shale fossils (updated from Aguiar, 2004). The Oriental region seems to be the richest in number of species, most of them in the genus Foenatopus (=Diastephanus, =Neostephanus). There are few recent revisionary works (Achterberg 2002; Aguiar 1998, 2001, 2004a; Aguiar & Janzen 1999; Aguiar & Johnson, 2003). Stephanids live mostly in tropical forests, but many inhabit desert or semidesert areas (see Benoit 1984b), reach high latitudes (e.g., Megischus bicolor in Canada, Stephanus serrator in Germany, Hemistephanus artiosulcatus in Argentina), or are endemic in many oceanic islands throughout the world. The genera are normally restricted to one or two particular zoogeographical regions, such as Hemistephanus (Neotropical), Parastephanellus (Oriental and Australian), and Foenatopus (mostly Oriental and Afrotropical). No stephanid species, except for one introduced taxon, has been found in more than one zoogeographic region, suggesting a considerable degree of endemism (Aguiar, 2005). There are no species of stephanids known from Chile. Live specimen of Megischus bicolor (Westwood), a common U.S. and Mexican species. Image © James B. Whitfield. Stephanids are solitary idiobiont ectoparasitoids of wood boring insect larvae. Most develop in Coleoptera, especially Cerambycidae (Benoit 1951a, 1984a, Blüthgen 1953, Meyer et al. 1978, Pagliano 1986, Völlger 1994, Visitpanich 1994) and Buprestidae (Townes 1949, Chao 1964, Mateu 1972, Pagliano 1986, Braza 1989, Carlson 1972), but several other families of Coleoptera, as well as larvae of siricid wasps (Taylor 1967a, Kirk 1975) and apparently of solitary bees (Berland 1951, Malyšev 1966, Königsmann 1978) can also be attacked. Indirect evidence suggests that host specificity is low, but polyphagy is confirmed only for two species: Schlettererius cinctipes, from eastern United States (Kirk 1975), and Stephanus serrator, from central Europe (Blüthgen 1953, Pagliano 1986). Adults seem to be predominantly diurnal, but some species are attracted to light traps (Naumann 1992, and personal observation), suggesting that flight activity may start in, or extend to crepuscular hours. Flight and other movements are usually slow and weak, but cryptic coloration and behavior contribute to make many species inconspicuous in their habitat. Nevertheless, high concentration of individuals in exposed conditions, for mating or oviposition, occurs at least for a few species in the genera Stephanus (Völlger 1994), Hemistephanus (personal observation), Parastephanellus (Rodd 1951), and Foenatopus (Cheesman 1932, Gauld 1995). Overall size ranges from three millimeters, for some males of the Australian Parastephanellus rufoornatus (Cameron), to nearly 100 mm, including the ovipositor, for some females of the Neotropical Megischus maculipennis Westwood. Adults can be easily recognized by the presence of five distinct tubercles on the top of a spherical head (hence the name stephanus, Greek for crown), an elongate pronotum, all hind leg parts (coxa, trochanters, femur, tibia and tarsus) highly modified, and a very slender body. 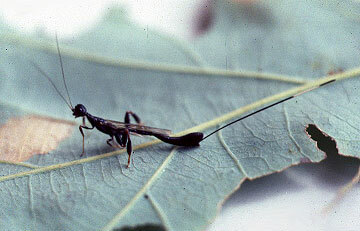 Females always have a long ovipositor, at least as long as their own body length. Males have a dorsally compressed metasoma, and are nearly always considerably smaller than females, which show a laterally compressed metasoma. Most species are dark brown or black, sometimes with reddish tones, and often with a red head; yellow and orange are most common in species living in dry or semi-dry regions; white is often present in some Foenatopus and Parastephanellus. A fore wing with a transverse dark stripe may occur in some tropical species. Parastephanellus rufoornatus (Cameron), a very common, endemic Australian species. Left: SEM of the head in dorsal view, showing the series of five tubercles which are characteristic of stephanids. Image © Alexandre P. Aguiar. Right: Habitus with part of ovipositor removed and shown below body. Note the slender body, highly modified hind legs, and long ovipositor typical for stephanids. Drawing © Andrey Sharkov. All synapomorphies mentioned above, except number 8, are also found independently in other Hymenoptera, and therefore represent parallelisms. Perhaps the most characteristic feature of stephanids is the presence of the coronal tubercles. Their occurrence in orussids as well has long been noticed (e.g., Ashmead 1900b), and has been used to suggest that stephanids and orussids might be closely related (e.g., Engel & Grimaldi 2004). However, the structure of these tubercles is different in each family: stephanids have an odd number of tubercles, with a posterior and a central pair, and a single anterior tubercle placed medially, or 5 total. In orussids, there are 6 tubercles, organized in aligned pairs. Aguiar (2005) defends that this difference supports the idea, also implied by the cladistic analyses in Vilhelmsen (1997) and Ronquist et al. (1999), that the presence of tubercles are independent synapomorphies for each family. Aguiar (2000) invariably retrieved this feature as a synapomorphy for stephanids, in all cladograms, regardless of the method or parameter used in the analyses. The recognition and definition of stephanids as a distinct family was a persistent problem for nearly a century and a half, mainly because of similarities with members of Ichneumonoidea. 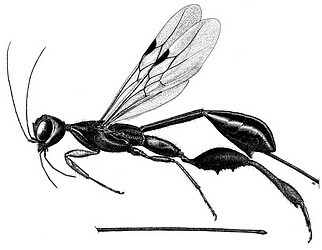 Classification doubts started with the first stephanid in the scientific literature, described by Zschach (1788) as an Ichneumonidae, but later transferred to Braconidae by Fabricius (1804), and then placed among the Evanioidea by Jurine (1807). Leach (1815) was the first to propose classifying stephanids, then known from a single species, in a separate family, the "Stephanida," first spelled "Stephanidae" by Haliday (1839). However, Leach (1815) also included the ichneumonid genus Xorides in the family, and again classified the group as part of Ichneumonoidea. Westwood (1841) was the first author to formally investigate the problem, dissecting and comparing specimens, but he concluded that stephanids should be transferred back to Braconidae. Westwood's proposition was not fully adopted, but seems to have been influential in that stephanids and ichneumonids were not associated thereafter. Some doryctine braconids were later treated as stephanids (e.g., Kieffer 1908, Enderlein 1901, Kieffer 1911a, Strand 1911), but Elliott (1922) transferred these taxa to a different family, the "Stenophasmidae," and provided the first accurate diagnosis for the family Stephanidae. The notion that stephanids were somehow related to the Ichneumonoidea, however, persisted until recently (e.g., Townes 1949, Carlson 1979, De Santis 1980), being convincingly dismissed only under phylogenetic examination (Rasnitsyn 1980, Sharkey & Wahl 1992). Currently, the most widely adopted hypothesis suggests that stephanids are best classified in their own superfamily, the Stephanoidea (Rasnitsyn 1980, Gauld & Bolton 1988, Goulet & Huber 1993, Gibson 1985, Naumann 1992), although Rasnitsyn (1988, 2000) includes the traditional Trigonalyoidea, Megalyroidea, Ceraphronoidea and some extinct lineages in the Stephanoidea. The family has also been treated as part of, or closely related to the Evanioidea (Jurine 1807; Smith 1861a, b; Cameron 1903), Megalyridae (Ashmead 1900b, Riek 1973), and Orussidae (Ashmead 1900b, Hanson & Gauld 1995). Some authors suggest that the family may be the sister group of all other Apocrita, or at least one of its most basal taxa (Gibson 1985, Whitfield 1992), but this idea apparently is not unambiguously supported when all available evidence is considered (Ronquist 1999). Opinions about the delimitation and synonymy of the various stephanid genera proposed in the literature vary greatly, ranging from the adoption (Schletterer 1889a) or defense (Ceballos 1926) of a single genus in the family, to intermediate (Townes 1949) or consenting (Orfila 1956) interpretations, sometimes with adoption of tribes (Engel & Grimaldi 2004) or subgenera (Achterberg 2002), or even the defense of genera based on extreme reinterpretations of taxonomic characters in stephanids (Benoit 1951a). This shows that a conservative approach for the supraspecific classification of the family is desirable, if not necessary, until an adequate and thorough cladistic analysis can be conducted, a point already exemplified by Aguiar (2005). Aguiar (2000) defends that there is no support for the sister group relationship of Stephanidae and Orussidae, but suggests instead that stephanids belong within the Microhymenoptera clade of a biphyletic Apocrita (the other clade being the Aculeata), as the most basal taxon of non-ceraphronoid Evaniomorpha (i.e., basal to Evanioidea, Megalyridae and Trygonalidae). The genus-level cladogram above was generated using the matrix of Aguiar (2000), updated with representatives of all other stephanid genera proposed since then. The revised study provides an analysis of 176 informative morphological characters for 64 stephanid species, representing all known living and extinct genera. 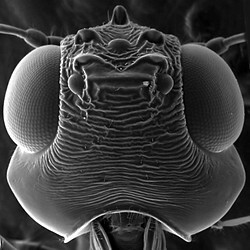 The resulting tree was rooted at the point of lowest resolution for stephanid species with a series of distinctly unspecialized features for Hymenoptera (not observed in other stephanids). Results indicate strong support for clades represented by the genera Hemistephanus Enderlein, Parastephanellus Enderlein and Foenatopus Smith (sensu lato), but no other genus can be consistently defended. First, almost nothing solid can be stated about the extinct genera, here mostly collapsed in the tree; the respective species are represented by largely incomplete specimens, making any assertion on their systematics hardly more than a simple "educated guess" ­ there seems to be just too little information to yield reliable interpretations. The type species of Madegafoenus Benoit (at the botton of the tree), and all species of Neostephanus Kieffer and Diastephanus Enderlein are also virtually indistinct from each other and from Foenatopus, whichever literature definition is adopted for them. The genera Comnatopus and Profoenatopus seem to be monophyletic, but only one species of each has been examined. The worldwide genus Megischus Brullé was, in its turn, retrieved as a highly paraphyletic lineage, composed of several independent clades, while also containing, spread out in the tree, several species attributed in the literature to the genera Afromegischus or Madegafoenus. Aguiar (2005a), working with M. basalis Aguiar, suggests that aberrant species of Megischus are not uncommon, and that establishing even basic relationships of such "oddballs" with other stephanids is an arduous task. Thus, while erecting new genera from such taxa without a proper cladistic analysis is easy, it is hardly enlightening, and can only expand the degree of confusion between genuslevel definitions.